Embedded systems are notoriously difficult to work with for beginners (even with NetBurner’s simple and easy-to-use tools, non-engineers sometimes find it intimidating). Also, it is hard to develop good-looking and friendly user interface(UI) for an embedded device. 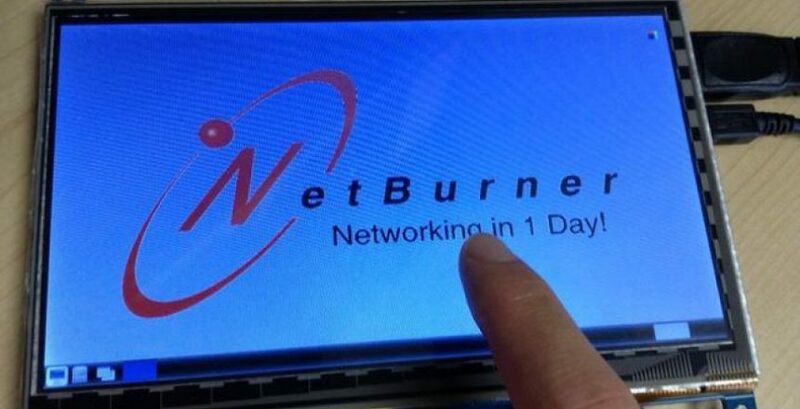 This project will shows you how to develop a easy to use touch screen device to display web interface on a NetBurner device. This project will allow the integration of all kinds of friendly UI as it is only a web application. For ease of use, I focused on having it set up and run with no required user input. In this article, I will show you a quick demo and step-by-step how-to guide to make your application efficient, convenient, and simple by displaying your UI on a touchscreen kiosk that meets my listed expectations. WaveShare Electronic’s 7-inch HDMI LCD. You will also need a Linux embedded system (I used a Raspberry Pi B+ version 1.2). Raspbian OS: installation could be done using NOOBS (New Out Of Box Software) which Raspberry Pi provides, but I did not want the recovery screen(shown below) to show up on every boot-up, so I choose to flash the OS image to the SD card using the win32diskimager. Warning: This step will wipe your SD card! Make sure to back up everything you want to save before you continue. First, you need to format your SD card. Open up SD Formatter and make sure the drive that the SD card is on is selected, then open up Options. Set FORMAT SIZE ADJUSTMENT to On, press OK, then press Format. Without FORMAT SIZE ADJUSTMENT, some card readers or host devices will not be able to use the full capacity of larger SD cards. After the SD card has been formatted, load the Raspbian OS image using Win32 Disk Imager. You must locate the image file and the device you wish to load. Then pressWriteto begin the process. Then, navigate to Internationalisation Options, select change keyboard, then pick Generic 105-key (Intl) PC unless you want another specific keyboard on the list. Select your language by selecting Other on the bottom (the default is English UK). Lastly, you want to set it so that it boots up to the desktop in order to utilize the GUI during development. This is done by choosing the third option in the main menu Enable Boot to Desktop/Scratch, then choosing Desktop Log in as user Pi. This step may differ if you choose to implement a different display. This command will open the autostart file with the text editor called nano. @lxpanel ...This ensures that the OS uses the stable default panel. For the display I am using, the driver can be downloaded here. After rebooting, your system will enable usage of the touchscreen. For additional security, set up a new user account that does not have super user permission. Set password to nburn as an example. If you want to change the username and password, you must also change the hard coded directory paths for the scripts that we will use to load up the application. The path is hard-coded to avoid having the user read and write at unwanted places or ask for permission to do so. If you want to enable power saving mode for the display (blank screen), then you can skip this step. Otherwise, you can disable the power save setting by following the below instructions. In the above command line, -s sets the screen saver timeout in minutes; setting it to 0 will disable the screensaver, and -dpms will disable display power management services. enter to save the changes. This step is to not necessary for the functionality of the display, but it will make the application look better at boot time. You can hide the logo that appears at the top-left corner. Open the command line file with sudo nano /boot/cmdline.txt then add logo.nologo in front of the contents. loglevel=1to activate change in cmdline.txt (same as Hide log section above). When I first started this project, I thought it would only take a day or two. I was wrong; as each milestone of the project was met, I wanted to make it more convenient, usable, and stable. For example, after I finally got everything working on the Linux desktop, I decided to change so that it does not require booting up to the Desktop. I wanted it to use minimal resources and run only core programs. Another example is when I got the system to boot off the hard coded MAC(Median Access Control) properly. I wanted it to automatically search for available devices that it can connect to, and then give the user the option to choose which device to make a connection. Another challenge was writing python scripts. Learning a new language to do things like execute shell command, do basic file operations, work with user input, and use signals and alarms had to be done in a short development cycle. It was challenging and fun. Mostly, I am proud and confident in this product; I know it will become a very useful tool. I hope you guys enjoyed my article! If you want to check out the script without downloading, then check here. If you would like to read more in depth, I will discuss some design logics below. Thanks for reading! While NetBurner modules are capable of integrating stand-alone graphical environment, embedded systems should be lightweight and efficient. Loading up the graphical display driver and running it would not only consume limited flash storage, but also limited processing resources. It would make sense to have the module do what it does best, and make the stand-alone display interface serve as a generalized UI for all other devices (like how monitor can be used for different desktops). Another question is: why not just run everything in Linux? If you are looking for a real-time computing solution, Linux is not what you want to consider. All variants of Unix and other modern OS, and Linux(Raspbian in our case) support preemptive multitasking. However, Linux’s real-time scheduling is soft real-time. This means the scheduler offers certainty about relative priorities, but the kernel does not offer any guarantees on how quickly the process will be scheduled once it becomes runnable. So, if you want a real-time computing solution, you should be looking at an RTOS. NetBurner has its own OS and it can guarantee a minimum latency between when they start running as they become runnable. Therefore, it would make sense for a product with a display to use an efficient OS such as an RTOS. Another problem is the issue of communicating with and controlling hardware. With Linux, this has to be done with kernel drivers and must be split off the main application. They are difficult to write and use, therefore complicating otherwise simple applications.